I love this Retro Ad & Recipe for Valentine's Day Cake for Catch-a-Valentine Cake. So pretty and yummy. 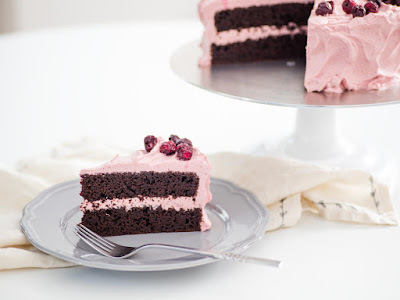 But since it's not chocolate, I also added a link to a wonderful recipe for Chocolate Cherry Layer Cake for Valentine's Day from Serious Eats. So plan your Valentine's Day celebration and make one or both of these delicious Valentine's Day Cakes. I love this recipe for Chocolate Cherry Layer Cake from Serious Eats. Tart Cherry Juice is a new ingredient in chocolate cake for me, but maybe it shouldn't be. The tart cherries bring out the earthy chocolate. I drink tart cherry juice, so it's a staple in my fridge. You won't really taste the cherry in the cake, but it's there, and it does subtly change the chocolate flavor. This recipe also calls for natural cocoa powder. Serious Eats suggests Valrhona Cocoa or Cacao Barry Extra Brute, but you can use Guittard or Ghirardelli...or whatever you have. Of course, the better your ingredients, the better the cake. For the Serious Eats recipe, tips, and step by step directions, go HERE. Dexo was like Crisco...it's shortening..